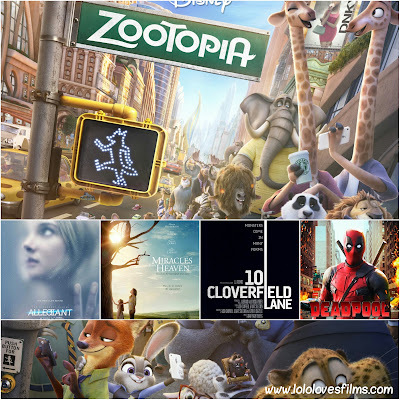 Claiming victory this mid-March weekend was "Zootopia" for the third week in a row, which pulled in another $38,042,000 to its $201,807,497 domestic gross total. In second place this weekend was the latest new entry in the Divergent film series, "Allegiant," which made an underwhelming $29,050,000. It was easily the lowest opening weekend for any film in that series. In third place was another newcomer in "Miracles From Heaven," making $15,000,000 this weekend after a debut on Wednesday, which earned it a little over a million bucks. In fourth this weekend was "10 Cloverfield Lane," which pulled in around $12,500,000 in its second week out. Finally, rounding out the top 5 this weekend was "Deadpool," which added another $8,000,000 to its whopping $340,941,383 domestic total gross. "Batman v. Superman" is looking to potentially shatter March records with its release next weekend, and it seems as if there's no competition in sight.